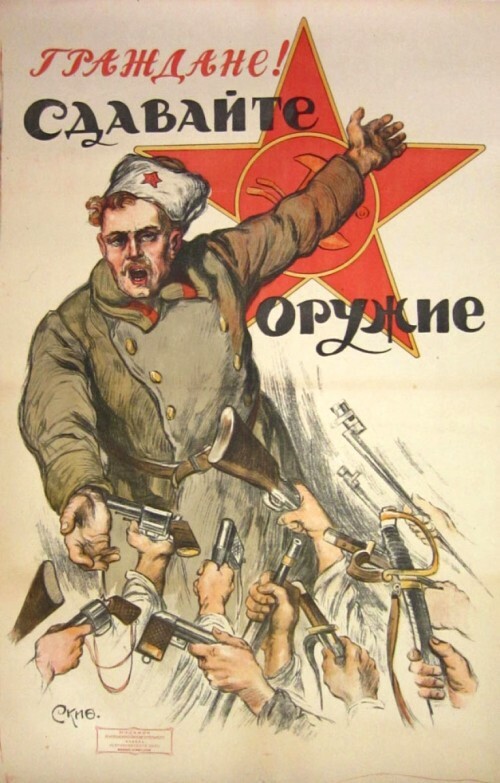 This 1918 Communist propaganda poster from the Russian civil war serves as yet another reminder that tyrannical regimes throughout history have always sought to disarm their populations through gun control. The poster shows Russian citizens turning in their rifles, handguns and even swords as a communist soldier looms over them with the words, “Comrades, turn in your weapons” appearing in front of a hammer and sickle inside a red star. … in October 1918, the Council of People’s Commissars (the Communist government) ordered citizens to surrender all firearms, ammunition, and sabres, having first mandated registration of all weapons six months earlier. Just like the Nazis, Communist Party members were exempt from the ban. A 1920 decree then imposed a minimum six month prison sentence for any non-Communist possessing a weapon. After the civil war, possession became punishable with three months hard labor plus fines. After Stalin came to power, he made possession of unlawful firearms a crime punishable by death. With Russians almost universally disarmed, Stalin was given free reign to carry out one of history’s most brutal prolonged genocide, with tens of millions of people executed or starved to death in the three decades that followed, a model subsequently mimicked in China and Cambodia. Of course it can’t happen here, after all, we have the Constitution and the Bill of Rights, at least on paper eh? What was it bush said, “it’s just a piece of paper”. But so is the “patriot act”. The question is which piece of paper to follow. Guess what, it IS happening right now, before your eyes, at the hands of the same families and institutions that financed the rise of hitler AND lenin, the people who have no ideology except power, the central banksters, who can create money out of nothing and charge interest on it. The ones that have looted this country to penury, and are now preparing to impose the shock doctrine. The founders weren’t stupid. They knew what it was like to be up against the most powerful military in the world. I bet the vast majority of the british soldiers were just as humane and patriotic and brainwashed as a typical american soldier today. But as history shows, it doesn’t matter. What matters is exposing the traitors in our midst, the ones who carried out 9/11 and countless other criminal acts against countries around the world, so that american soldiers know who the enemy really is. Also see “Innocents Betrayed” in the reference section. Down through history, governments have disarmed their citizens only to tyrannize those citizens once they were disarmed. The following chart documents just a few examples from recent history where “gun control” laws were enacted and then tyranny by the government proceeded. *Click on a country in the chart in order to learn about what occurred in that country.